Apartmetn is located in 5 min. walk from Gostiniy dvor metro station. 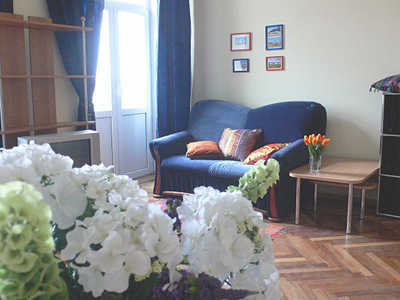 Spacious light 3 room apartment with balcony on the 5th floor, total square 100 m2. There are 2 bedrooms - 14 and 18 m2 and double bed in each of them. There are 2 double sofas in the livingroom, square 26 m2. There are jacuzzi and heated floor in the bathroom. 2 WCs. Entrance is from Manezhnaya square, intercomm system on the front door. Equipment: satellite TV, VCR, refrigerator, washing mashine, music center, microwave, phone, iron, hair dryer. Great view from the windows in the livingroom to Manezhnaya square and Saviour-On-The-Blood Cathedral.